Uh-oh - it's Friday the thirteenth! Maybe today will be a lucky one instead of unlucky and you will win a giveaway. Good luck! Sorry about link #19. It is wrong. If you get a chance would you mind deleting that for me? Also, I'm adding your link to my linky directory. 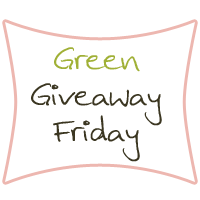 Would you like me to make a note that it is limited to green giveaways?